In the previous tutorials, we have learned about OpenCV and done some basic image processing and then in next tutorial we have done some image manipulation in OpenCV like cropping, rotation, image transformation etc. So in continuation with previous Image Manipulation tutorial, here we learn some more image manipulation techniques like and at the end of the tutorial we will build a python-opencv program to make live sketch from the webcam live feed. This application will use many of Image processing functions which we have learned so far or will learn in this tutorial, so this will be a good practical example to cover all the functions. As told in the previous tutorial, OpenCV is Open Source Commuter Vision Library which has C++, Python and Java interfaces and supports Windows, Linux, Mac OS, iOS and Android. So it can be easily installed in Raspberry Pi with Python and Linux environment. And Raspberry Pi with OpenCV and attached camera can be used to create many real-time image processing applications like Face detection, face lock, object tracking, car number plate detection, Home security system etc. Bitwise operations help you in image masking and helps you to create some simple images. A convolution is an mathematical operation performed on two functions producing a third function which is typically a modified version of original function. In computer vision we use kernel’s to specify the size over which we run our manipulating function over our image. OpenCV blurs an image by applying kernels, a kernel tells you how to change the value of any given pixel by combining it with different amount of neighboring pixels the kernel is applied to every pixel in the image one by one to produce the final image. Simply saying, an image convolution is simply an element wise multiplication of two matrices followed by a sum. We can simply understand it by the following example. The above is a 3X3 Kernel. We multiply by 1/25 to normalize i.e. sum to 1 we had been increasing the intensity or decreasing the intensity as in the case of brightening or darkening of images. cv2.blur – Averages value over a specified window. cv2.GaussianBlur – Similar but uses a Gaussian window (more emphasis on points around the center). cv2.medianBlur– Uses median of all elements in the window. cv2.bilateralFilter– Blurs while keeping the edges sharp, it preserves the edges and line details. In this method averaging is done by convolving the image with a normalized box filter, this takes the place under the box and replaces the central element. Here the box size needs to be odd and positive. It takes median of all pixels under the kernel area and central element is replaced with this median value. #is replaced with this median value. Sharpening is the opposite of blurring, it strengths or emphasizes on edges in the image. Our kernel matrix sums up to one, so there is no need to normalize (i.e. multiply by a factor to same brightness as of original), if kernel is not normalized to 1 the image would be brighter or darker. #value above 127 are truncated (held) at 127, the 255 argument is unused. Dilation – it adds pixels to the boundaries of object in an image. Erosion – Removes pixels at the boundaries of object in an image. Opening – Erosion followed by dilation. Closing – Dilation followed by erosion. Opening is very much helpful in denoising the images as it first thins the image by erosion (removes the noise) and then dilates it. There is sometimes confusion between dilation and erosion usually in pictures with white background, as opencv considers white background as image to be dilated or eroded instead of original picture, so in this case erosion works as dilation and vice-versa, as shown in image sample shown below. Edge detection is very important area in computer vision, especially when dealing with contours. Edges can be defined as boundaries of image, actually they are edges which define object in images they preserve a lot of information about the image. Formally Edges can be defined as sudden changes (discontinuities) in an image and they can encode as much information as pixels. The above image shows how computer vision identifies and recognizes the image. Sobel – to emphasis on vertical or horizontal images. Laplacian – optimal due to low error rate, well defined edges and accurate detection. 3. applies non-maximum suppression (i.e. removes pixels that are not edges). #in canny we need to provide two values: threshold1 and threshold2. #any gradient larger than threshold 2 is considered to be an edge. #any gradient larger than threshold 1 is considered not to be an edge. #non edges wheareas any value above 120 are considered as edges. Let’s take a step back and have a look at affine and non-affine transforms, the original image shown below is clearly an non affine image as the edges are going to meet at some point however, we can straighten it by warping and taking the perspective transform. For this perspective transform we need the four coordinates of the original image and then the four points of the output image, they are denoted by points_A and points_B. Firstly with the help of these points we compute a transformation matrix, M with the help of getPerspectiveTransform function. And then this matrix is given to the warpPerspective function to generate the final output. Now let’s first try the Perspective transform. Affine transform is easier then the non-affine transform as we need only three points to get the transform. The whole process goes the same but instead of perspective transform we now have affine transform and also we define cols and rows in warpAffine from the shape function instead of manually entering it. First of all, congratulate yourself that you have made up to this mini project after reading all the image manipulation functions above. So in this mini project of Python OpenCV we are going to learn some new concepts of loops and functions. If you are familiar with programming, you must have a broader idea of what the function and loops are. However, in python the basic concept of loops and functions remains the same but the method to define them changes a little. So at start of this program we can see a certain group of statements heading under the “def sketch(image) :” this is a formal definition of a function a group of statements working together for a certain output. So this sketch is a function, in python function is defined by “def” and ends with a “:” mark. Also the statements which are required to be inside the function or you can say which are required for the function to work properly, are side aligned automatically by the function. So to come out of the functions the statements needed to be totally left aligned. For the further references you can refer to google on how the functions are defined in python. So in this sketch function we have introduced several layers of image processing which combine together to give an output. Firstly, the image is converted into grayscale so the opencv can process it easily and then a Gaussian blur is applied to the gray scale image so as to reduce the noise. Then the edges are being extracted with the help of the canny’s edge detection algorithm then a binary inverse is applied on the edge defined image, here the binary inverse could also be done by bitwise_NOT but we had deliberately chosen this threshold binary inverse as it gives freedom to sets its parameters till we get a clear image. Also to note that the function takes the arguments image and returns the two arguments ret and mask. While the ret is the Boolean telling that function is run successfully or not and the mask is the final output of the function i.e. the processed image. Then the second concept is of operating webcam in opencv that is done by cv2.VideoCapture(0) function, which stores the image in an object cap that cap can be read with cap.read() function, also here to note that cap.read() is inside the infinite while loop as it continuously had to capture the images, to give it a sense of a live video, where the frame rate of the video would be the frame rate of your webcam which is mostly between 24 to 60 fps. cap.read() returns ret and frame, where the ret is the Boolean indicating that the function was successfully run or not and the frame contains the image taken by webcam. So this is the end of Part 2 of Image manipulations in Python-OpenCV. 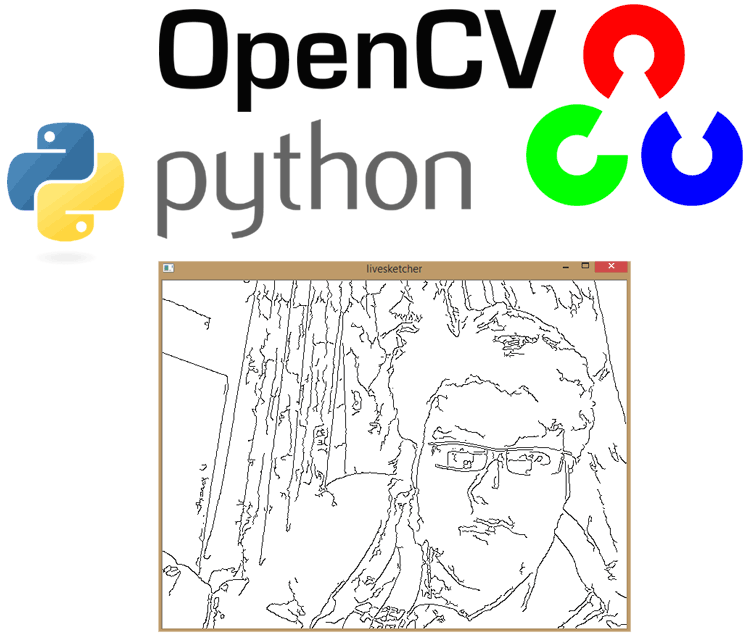 To get good understating of computer vision and OpenCV, go through previous articles (Getting started with Python OpenCV and Image Manipulations in Python OpenCV (Part 1) and you will be able to make something cool with Computer Vision.